“Done” means that every street is mapped and named, along with touristic highlights— parks, government and military buildings, churches and temples, guilds, schools, hospitals, and major stores and inns. There’s plenty of room for more buildings, but I’m pretty happy with the coverage. The size of the Illustrator file is 4.6 meg; the artboard is nearly 17 feet square. There are over 1500 features named. Most of the street names have meaning in Verdurian culture and history, though there are also lots of in jokes (so, your name may be in there, but you’ll have to know Verdurian to recognize it). It’s based on a poster board map I made years ago, with transparent colored film and X-acto knife (ah, in the pre-computer era, how exciting it was to wander the art supply store). 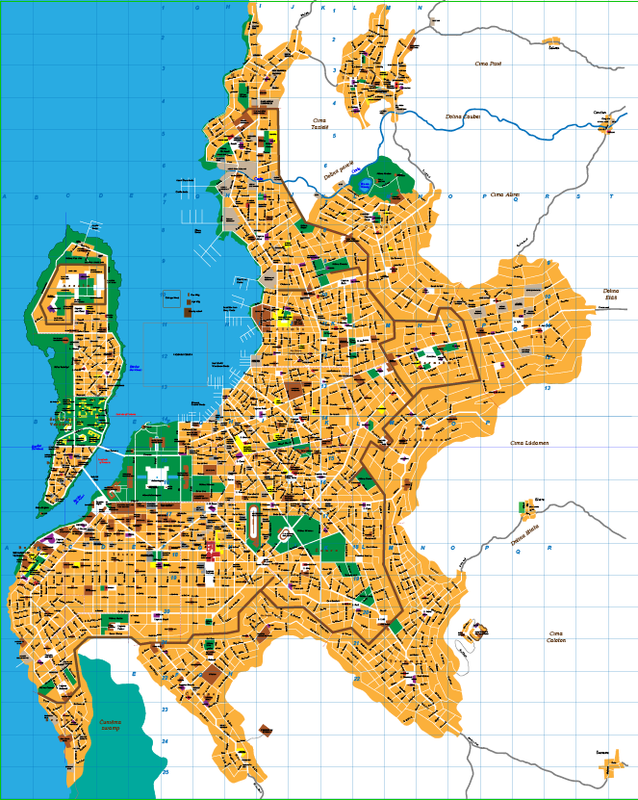 However, that map covered only about 1/3 of the city, and of course it couldn’t be shared. Next up: chopping the thing into maps of each neighborhood so they can be put into the Almeopedia. By the way, the square in the middle of the water (at F10) is the size of a Chicago city block, 1/8 mile on a side. The little brown rectangles just to the right are some real buildings so I could size structures correctly– the top one is my apartment building; the bottom one is a nearby school. I had a wacky plan to re-create the whole island of Arcaln in Hammer. Instead I’m working on a part of the Nezi neighborhood, in Unity, as part of a video game.